Synthetic genomics may be the most common dual-use biotechnology today. The ability to construct double-stranded DNA from scratch enables a better understanding of protein structure and function, and the development of new vaccines, speeding up the process of biological engineering. However, these technologies also have the potential to allow people with nefarious intentions access to toxins and pathogens that would be otherwise difficult to acquire. With each passing year, synthetic biologists are becoming more adept at designing novel structures and functions from DNA, RNA, and proteins—the basic building blocks of biology. The Central Dogma of molecular biology is that DNA is transcribed into RNA, which is then translated into proteins (4). Proteins then perform a variety of functions inside and outside the cells. They can join together to build the cytoskeleton of the cell, break down molecules to produce the energy the cell needs, and much more. However, proteins can be also used to synthesize toxins such as cyanide salts and aflatoxins. Proteins can also themselves be toxins, such as ricin or Botulinum toxin. These approaches even confer the ability to create viruses from scratch. In the past, DNA synthesis was a key step of the de novo (i.e., from scratch) synthesis of poliovirus, the 1918 influenza virus, and most recently horsepox virus. While the synthesis of an infectious virus requires a high degree of technical expertise, access to DNA was a bottleneck. For a ‘booted’ virus to be infectious, its synthesized DNA must have as few errors as possible. While benchtop synthesizers make it easier to synthesize double-stranded DNA without having to order a sequence from a gene synthesis company, this method typically leads to too many errors to make a long genetic sequence with high enough accuracy. This potential threat can be reduced if gene synthesis providers screen their orders. Therefore, in 2010, the US department of Health and Human Services published the Screening Framework Guidance for Providers of Synthetic Double-Stranded DNA. This guidance recommends that companies screen both the customer and sequence of any gene synthesis order to ensure its legitimacy (13). However, since the publication of the HHS guidance, the gene synthesis industry has quadrupled in size, and the number of providers doubled. This once US-based industry is now growing, and is projected to keep growing, particularly in the Asia-Pacific region, where it was almost absent when the HHS guidance was written (14). Here at the Johns Hopkins Center for Health Security we are currently mapping the gene synthesis industry in order to understand which changes are necessary for the future of the HHS guidance. We are searching for gene synthesis companies and cataloguing them based on their laboratory locations, the reach of their shipments, and the breadth of their screenings. We have published here a work-in-progress map with the hope of receiving feedback from the public and gene synthesis companies and ensuring the information we collected is correct. If you would like to add a gene synthesis company to this map, or if you can verify information about a gene synthesis company’s laboratory locations, shipping, or screening protocols, please email Noga Aharony at naharon1@jhu.edu. We are assembling this information for publication, and will be making further recommendations regarding gene synthesis order screening. 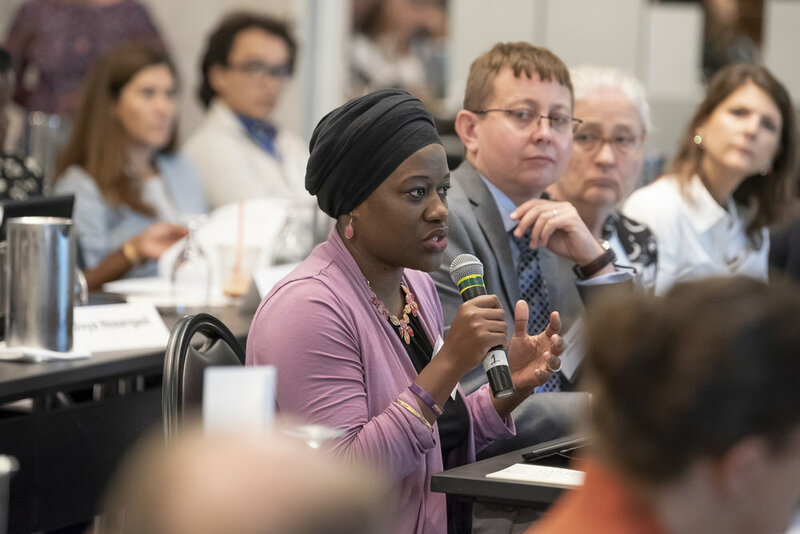 In mid-June, the National Academies of Science, Engineering, and Medicine held a workshop called “Understanding the Economics of Microbial Threats”, bringing together economic and public health subject matter experts to discuss the economics of infectious disease emergencies. Discussion topics were diverse, ranging from preparing for the next pandemic to tackling antimicrobial resistance. An inability to control a deadly outbreak substantially affects regional and global stability. The 2014 Ebola outbreak cost resource-constrained Sierra Leone, Guinea, and Liberia almost $3 billion, and contributed to longer term reductions in GDP. Outbreaks burden communities both through associated direct costs of preventing and treating illness, and the resulting longer term reduced labor productivity and health consequences. Dr. Tom Inglesby, our Center’s director, was a workshop panelist and described challenges and important considerations for optimizing responses to global catastrophic biological risks (GCBRs). An ideal response to these large-scale pandemics is multifaceted, requiring substantial planning, stockpile maintenance, non-pharmaceutical interventions (e.g., closing schools), and flexibility to account for unique pathogen attack or mortality rates. Strengthening resources to address GCBRs is critical. Though scientists and governments have historically focused on other catastrophic risks like nuclear threats, the consequences of inadequately preparing for the next pandemic could be immense, as we demonstrated in the Center’s recent Clade X exercise. Despite consensus in the health economics community that infection control is important, these messages often do not resonate with other key stakeholders. As Workshop Chair Dr. Peter Sands articulated, economic policymakers rarely fully consider the financial burden of microbial threats. A contributing factor to this, Dr. Martin Meltzer explained, is that future pandemics are inevitable but unpredictable, appearing anywhere between once every 10 to 60 years. This time range makes the necessary investment in infection control often unpalatable to policymakers who prefer shorter-term solutions with clear outputs that can be achieved within terms or election cycles. Furthermore, the way in which modeling results are sometimes communicated can sometimes backfire. Some speakers cited that “trillion-itis”, or the tendency for modelling results to express potential findings in terms of billions and trillions, can make these issues appear too challenging to address. Communicating economic findings in compelling, transparent, and easily digestible ways is critical. One of the most discussed topics was antimicrobial resistance (AMR). A clear threat to global health security, AMR has received increasing attention from governments, industry, and academia-- but finding solutions remains daunting. A key issue is that pharmaceutical investment in antibiotics is generally not as profitable as other drugs because antimicrobial prescriptions are usually for acute issues and are restricted to reduce future drug resistance. Executives from major pharmaceutical stakeholders including Merck, Pfizer, and the International Federation of Pharmaceutical Manufacturers and Associations (IFPMA) discussed potential strategies they believe could address this issue. While many government-led incentives are designed to “push” industry to increase investment through initial R&D benefits, speakers cited the need for “pull incentives” that enable companies to view antibiotic development as a truly profitable long-term venture. Similar suggestions were stated in a recent World Economic Forum report. Ensuring market exclusivity, fostering public-private partnerships such as CARB-X, or structuring reimbursement mechanisms so that profits aren’t based on total use were also proposed as important future directions. Conversely, some participants acknowledged that solutions to incentivize industry can be politically challenging because they often result in resource-limited governments paying for-profit companies more for their products. Ensuring transparency, trust, and empathy for the complexities of these issues were cited as important considerations to tackle AMR. The valuable discussions and research presented in this two-day workshop served as an instrumental stepping stone for future progress in understanding and addressing the economic issues of infectious disease. Strengthening our national health security has been an enduring, bipartisan objective of the federal government for many years. Prompted in part by infectious disease threats like Ebola, Zika and this past year’s particularly severe seasonal influenza, Congress has used the reauthorization of a key piece of health security legislation as a moment to take stock. The Oversight and Investigations Subcommittee of the House Committee on Energy and Commerce recently called a hearing on the federal government’s ability to respond to natural and intentional infectious disease threats. The conversation mostly centered around pandemic influenza and the development of medical countermeasures for biological attacks. There was a significant amount of focus on preparing for an influenza pandemic, particularly in terms of detection and response. There were a lot of questions directed towards the NIH and FDA representatives on this topic. They both emphasized the importance of inter-agency collaboration to speed up the clinical trial process. There is bipartisan support for the reauthorization of the Pandemic and all Hazards Preparedness Act (PAHPA), which will provide funding and resources to combat emerging infectious disease threats. Concern was expressed by committee members over the transfer of the Strategic National Stockpile (SNS) from the CDC to the Assistant Secretary for Preparedness and Response (ASPR). Representatives from both agencies reassured committee members of ongoing communication efforts to ensure a smooth transition. Many questions about the development of medical countermeasures and getting those products rapidly in to the market were directed towards the witnesses from NIAID and the FDA. Dr. Fauci of NIAID made several references to the promising avenue of multiplex point-of-care diagnostic tests that are capable of detecting multiple different viruses in one test with one sample. These tests would revolutionize response efforts to disease outbreaks, particularly in resource-poor settings. Dr. Fauci seemed enthusiastic about the technology, saying that “multiplex is a very important tool of the future now for detecting outbreaks.” Dr. Fauci also discussed Phase II trials for an Ebola vaccine and ongoing work to develop a universal influenza vaccine; although he admitted that such a product is still years away. Re-authorizing PAHPA would be an important step in increasing the capacity of the United States to protect its own citizens and the global community from infectious disease threats. The original act was signed into law in 2006 and was re-authorized in 2013. A current reauthorization is being undertaken by Congress under the title of the Pandemic and All-Hazards Preparedness and Advancing Innovation Act (PAHPAI). PAHPAI will continue to support important preparedness efforts such as funding the development and stockpiling of vaccines, therapeutics and medical devices that will be needed during an emergency and enabling local, state, and federal public health agencies to rapidly respond to infectious disease emergencies. In his opening statements, Chairman Mr. Harper said, “Passage of PAHPA’s reauthorization would not only provide critical certainty for public health agencies and industry partners, it would also bring about some much needed reforms.” In general, committee members appeared supportive of re-authorizing PAHPA. Of the roughly 1,400 bacterial, viral, protozoan, and fungal pathogens that are known to infect people, only a few have demonstrated the potential to cause a “sudden, extraordinary, widespread disaster beyond the collective capability of national and international governments and the private sector to control” – what my colleagues and I define as ‘Global Catastrophic Biological Risks’ (GCBRs). The members of this infamous club include some of humanity’s greatest scourges, including plague, smallpox, and pandemic influenza. While the current threat posed by these pathogens has been attenuated somewhat due to the modern infectious disease armamentarium (e.g., basic sanitation and hygiene, vaccines, and modern medical care), these and other pathogens nevertheless have the potential to cause mass death and the chaos and suffering that would inevitably follow. In response, governments and health authorities have attempted to bound the problem by compiling both formal and informal lists of the pathogens most likely to cause severe epidemics or pandemics. Notable examples include the WHO’s R&D Blueprint and the CDC’s Bioterrorism Agents list. While these lists serve important planning or regulatory functions, they also can inhibit a comprehensive understanding of the biological threat landscape. As the 2009 emergence of the pandemic H1N1 influenza virus in Mexico (rather than Southeast Asia) and the importation of Zika virus to the Americas demonstrate, surprise has been the norm. We believe this stems, in part, from list-based thinking. That’s why we were so pleased to see WHO include “Disease X” in this year’s update of the R&D Blueprint, as a reminder of the importance of constant vigilance and preparedness. This theme will feature prominently in the Clade X tabletop exercise that our Center is conducting this week. For the past several months, my colleagues and I have been working to identify some common characteristics of pandemic pathogens. We hope our findings will spur more nuanced assessments of biological threats. I encourage you to check out our recently released final report. There is one major finding from that report I want to highlight here. The fact is, the vast majority of illnesses and deaths from infectious causes are never definitively diagnosed. This is true regardless of where in the world care is rendered. Instead, clinicians primarily rely on constellations of signs and symptoms, what are called ‘syndromes’, to whittle down the list of things that could conceivably cause the illness. While far less labor intensive than tracking each and every case down to its root cause, this aspect of medical practice makes it far more likely that index cases or clusters of known or unknown pathogens will go unnoticed. We believe that clinicians the world over should be making routine use of classical clinical microbiology, clinical applications of next-generation sequencing, and point-of-care molecular diagnostics that are starting to become available. That information, once gleaned, should be rapidly and seamlessly transmitted to public health authorities. This improved flow of information would dramatically boost our ability to identify pandemic pathogens in a timely fashion. I’m excited to announce that with support from the Open Philanthropy Project, my colleagues and I at the Johns Hopkins Center for Health Security will be working over the next eighteen months to develop a plan to develop an Outbreak Science Initiative to support the US government in responding to infectious disease outbreaks. The program would formally integrate the nation’s top disease outbreak scientists into federal response operations, where they could produce the forecasts, models, and analyses that decision makers need to allocate resources, compare interventions, and assess progress on outbreak containment. This capability would improve our ability to respond to outbreaks quickly and effectively. We coin the term “outbreak science” to mean a subfield of epidemiology that uses infectious disease modeling, data science and visualization, and modern data practices for outbreak response. The goal of outbreak science is to connect public health decision makers with the most current data and analytics necessary to determine how best to contain outbreaks. Although this type of expertise has been influential in several major epidemics, it is often tapped by response officials in sporadic, ad hoc, and pro bono partnerships. There is currently no formal mechanism for public health officials to reliably and quickly access experts who can produce the models and analyses necessary to inform decision making. The use of outbreak science during the 2014-2015 Ebola response is illustrative of the value of outbreak science. One influential model published by the Centers for Disease Control and Prevention forecast a worst-case scenario of more than one million cases if the epidemic continued unabated. It’s widely acknowledged that the CDC model galvanized the international response that ultimately contributed to control of the epidemic. However, CDC is one of just two groups in government with embedded outbreak science expertise. Most of the other models used during the outbreak, including those used to forecast case counts and monitor containment, were produced by academics with no formal connection to the response. They worked without guidance about the public health questions that needed answering, without official data sets, and without compensation. They also had to put their results in academic journals instead of in the hands of decision makers. Conversely, decision makers without outbreak science support had no choice but to act without full analysis of the current and future state of the outbreak. This lack of adequate situational awareness potentially contributed to the late identification of funerals as superspreading events, and to the overdue surge of hospital beds. The disconnect between public health decision makers and modeling expertise limited the timeliness and applicability of most of the models produced during the Ebola outbreak, and reduced the effectiveness of the response. An outbreak science program would aim to close this critical gap in future public health events by formally integrating the best outbreak scientists into outbreak response operations to enable faster control of epidemics. Today, British Prime Minister Theresa May announced that a “Novichok” agent was used in the poisoning of Sergei Skripal and his daughter in Salisbury, England. This announcement is highly significant because the use of one of these agents points to a very sophisticated operation using next-generation chemical weapons. That the word “Novichok” was used publicly could also be highly consequential, as it has a very specific meaning and history. The word “Novichok” roughly translates to “newcomer” and reflects the special nature of this class of nerve agents developed and manufactured in the former Soviet Union. Very little information on them is available generally or in the medical literature. In general, nerve agents work by interfering with neurotransmission through the inhibition of acetylcholinesterase, the enzyme that breaks down the neurotransmitter acetylcholine. The continued presence of acetylcholine in the neuromuscular junction leads to perpetual muscle contractions. The result is a recognizable clinical syndrome characterized by salivation, lacrimation, urination, diarrhea, pinpoint pupils, and seizure-like activity. Death arises from paralysis of respiratory muscles. As nerve agents, the “Novichok” agents would be expected to operate in this manner. There are antidotes for standard nerve agents that can be beneficial if given in time. Familiar nerve agents include VX, sarin, soman, and tabun. “Novichok” agents appear to differ in a few key ways. First, they are deadlier - reportedly up to 10 times more lethal than VX. Second, the production of "Novichok" agents can be more readily concealed from weapons inspectors, according to a Soviet chemist who worked with them. Other properties, such as improved ease of handling and the ability to evade standard chemical detection equipment, penetrate personal protective equipment, and resist treatment efforts have also been suggested in the fragmentary literature. As more information emanates from these cases in England, attention to clinical details of the resulting illnesses and their treatment will be essential to understanding the nature of these deadly agents and how to best counteract their effects. Additionally, because this appears to be the first confirmed deployment of a “Novichok” agent with more than a dozen people potentially exposed, there is a pressing medical and public health need to have all clinically relevant information about these agents that may be possessed by government entities disseminated to healthcare professionals immediately. This latest use of a chemical warfare agent follows the 2017 assassination of Kim Jong-nam - the half-brother of North Korean dictator Kim Jong-un - in a Malaysian airport. In that case, a binary preparation of VX nerve agent was directly applied to the victim’s face. The US recently imposed additional sanctions on the DPRK in response. The use of chemical weapons is internationally prohibited by the Chemical Weapons Convention (CWC), to which 98% of the nations of the world are signatory. Though there is speculation that “Novichok” agents were designed to circumvent the CWC, any chemical used to cause harm is treated as a weapon, and their use is banned under the treaty. The UK government, the Organization on the Prohibition of Chemical Weapons (OPCW), and other national security agencies will need to investigate this particularly serious violation of the CWC. Centers for Disease Control and Prevention (CDC): There should be a big change at CDC as the Strategic National Stockpile program is moved from its long-time home in the Office of Public Health Preparedness and Response (OPHPR) over to the Assistant Secretary for Preparedness and Response (ASPR). The Public Health Emergency Preparedness (PHEP) Cooperative Agreement program at CDC would receive a $5 million increase above the estimated FY2018 Continuing Resolution (CR) level, while CDC Preparedness and Response would be cut by $20 million, Influenza Planning would get a slight boost, and Emerging and Zoonotic Infectious Diseases programs would be cut by $60 million. Office of the Assistant Secretary for Preparedness and Response (ASPR): As the new home for the SNS, ASPR’s budget would increase by over $575 million in FY2019. Other programs in ASPR would remain relatively flat, with the Hospital Preparedness Program (HPP) at $255 million (compared to $253 million estimated for FY2018), BARDA receiving about $2 million more than FY2018, and BioShield getting a $3 million increase. Pandemic influenza funding (split between ASPR and the Office of Global Affairs) would increase to a total of $250 million (almost $50 million more than in FY2018). For the Science and Technology Directorate, there is a proposed cost-sharing agreement for the National Bioforensic Analysis Center (NBFAC) within National Biodefense Analysis and Countermeasures Center (NBACC), where the FBI would assume operational costs for NBFAC (which is about 40% of NBACC’s total operational costs). In addition, S&T is proposing to transfer responsibility of the National Bio and Agro-Defense Facility (NBAF) Operations in its entirety to the US Department of Agriculture (USDA). Global Health Security Agenda: Funding for the Global Health Security Agenda in the FY2019 budget would include $59 million designated GHSA funding out of a $109 million budget in the Global Disease Detection line at CDC, and $72.5 million in repurposed Ebola supplemental funds at US Agency for International Development (USAID). GHSA funds for CDC would be on top of any unexpended Ebola supplemental funding at CDC, which expires in FY2019 for that agency. More to come in our comprehensive Federal Funding for Health Security analysis, published annually in Health Security.